Herbal Sun "Tea" is a seasonal favorite here. This is one of those things that I just sort of do without thinking about recipes so much. I go out early in the day (because honestly, that's the only time I can stand to be outdoors for long) and gather whatever tasty for tea herbs are most abundant. I give them a quick rinse if I think they need it, toss them into a glass jar or pitcher, bruise them a bit with a wooden spoon to get the process going, and fill the pitcher with cool water. I cover the container and set it in a sunny location on the back porch to infuse for a few hours. By the heat of the afternoon when I am ready for an icy, cold drink, my herb 'tea' is ready. If I am in the mood for a sweet drink, I add stevia or agave nectar. 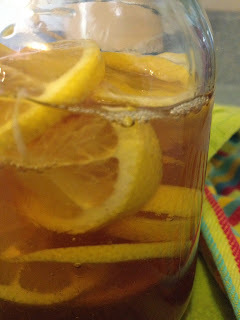 Pour over ice, add a slice of lemon and a sprig of mint or a Pineapple Sage flower and it is tea time! Sometimes I toss in sliced fruit or a few berries, dandelion blossoms, or rose petals. I may even add a tea bag or two- green tea most often. Here's to cold herbal drinks on hot summer days! Oh this is great! I am writing these down. I never know what to add besides mint! Thank you so much! Great post. Wish I was having a glass right now!